The My Payment Profiles page works with ShelbyNext | Giving and allow users to modify or delete their ShelbyNext | Giving payment profile. This new functionality automatically appears on the Arena online giving portal. The donor must be on the Give Online page in order to navigate to this option. Follow the steps below to make changes to payment profiles. 1. After logging in to your Online Portal, select the Give option. 2. Select the My Payment Profiles option from the right-navigation pane. 3. Your Payment Profiles are listed. 4. Click the Edit icon for one of your profile names. The Edit Profile window appears. You can modify the Profile Name (It is a nickname that the user decides), the Billing Street, and the Billing Zip. 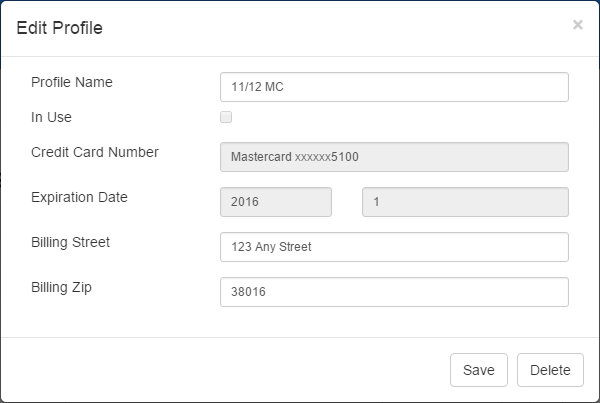 The In Use check box, Credit Card Number field and Expiration Date fields cannot be changed because they are stored on the gateway. NOTE: The In Use check box is checked when there is a recurring gift that is using this profile. 5. Click the Save button when you are finished making your modifications to the profile. Clicking the Delete button from the Edit Profile window is the same as clicking the Deactivate icon from the Payment Profiles grid. After deactivating a payment profile, that payment profile no longer shows as a payment option. This ensures that the card is not used anymore. If you deactivate a payment profile with a recurring gift, the recurring gift may be deactivated as well. You have the option to move the recurring gift to a different payment profile by selecting the Move payment to new profile check box. If you uncheck the Move Payment to new profile check box then both the payment profile and the recurring gift is deactivated.